This P-51 is a celebration of our nation’s armed forces. Every aspect of the paint represents those who have served, and those who gave the ultimate sacrifice. The silver ring behind the spinner represents the shinning halo of the guardian angel who guides service personnel, having given the ultimate sacrifice, to their final resting place. The stars and bars, proudly displayed, represent the armed forces symbol that all United States fighter planes carry. 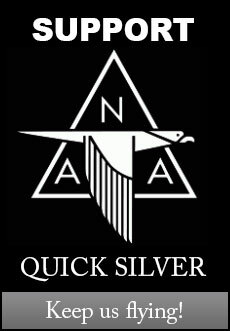 It carries the post war version because “Quick Silver” was never a part of a unit till after World War 2. Bill Yoak, an individual with a love and passion for this type aircraft did all of the metal work. The remanufactured parts are handmade. Unlike the hurried war effort parts, these are made with the skill and care of a master craftsman, and obtain the utmost attention to detail necessary to restore this Mustang to a condition better than factory new in 1945. As this silver bird quickly streaks across the sky, let us not forget those who served, sacrificed, and gave their all.